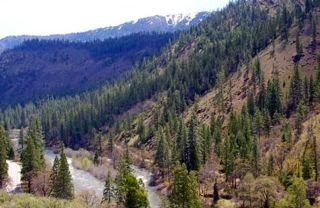 THPBlog: Fruit Growers Supply Company to clearcut at Dutch Creek near the Klamath River. Fruit Growers Supply Company to clearcut at Dutch Creek near the Klamath River. THP 2-13-087 SIS (Dutch Bear THP) Fruit Growers Supply Company, 561 acres; 71% clearcut, 28% selection, 1% roadside logging. Dutch Creek (MD: T47N R7W Sec.16, 17, 20, 21, 28). Winter operations, moderate erosion hazard, steep slopes up to 75%, 41 road drainage work sites, impaired 303.d watershed, herbicides, coho watershed, 3 spotted owls within 1.3mi, scattered large trees. Estimated public comment deadline: 12/12/13. This THP is 12 miles north of Yreka, CA, and about 4 miles north of Highway 96 and the Klamath River at an elevation of 3,600 to 5,680 feet. Fruit Growers Supply Company is planning a mostly clearcut tractor and cable logging operation on steep slopes in Douglas fir, ponderosa pine, white fir, incense cedar and sugar pine forests. The THP area flows down Dutch Creek into the Klamath River which is listed as impaired for temperature, dissolved oxygen, nutrients, organic matter and microcystin. Dutch Creek supports steelhead, while the Klamath River supports chinook salmon, coho salmon and steelhead. Fruit Growers Supply Company is proposing a modified selection removal to be able to remove a greater number of trees that they have determined are diseased, slow growing and/or dying. They are proposing to use ground based equipment in units designed for cable logging for site preparation, to yard logs, end-line logs, use tail holds and to construct fire breaks. There are 41 road drainage sites planned for work including rocking, dip construction, culvert repair and replacement, and road bed reconstruction. Potential habitat exists for Townsend's big eared bat in an abandoned mine shaft in Section 17. This THP will result in the loss of 1 acre of foraging habitat for spotted owl site SK362 within 1.3 acres, and the loss of 23 acres of nesting/roosting habitat for spotted owl site SK362 within 1.3 acres. For spotted owl site SK363; there will be a loss of 61 acres of foraging habitat within .5 mi, and the loss of 33 acres of nesting/roosting habitat within .5 mi, and the loss of 51 acres of foraging habitat within 1.3 mi, and the loss of 9 acres of nesting/roosting habitat within 1.3 mi. For spotted owl site SK467; there will be a loss of 58 acres of foraging habitat within 1.3 mi, and the loss of 14 acres of nesting/roosting habitat within 1.3 mi, and the loss of 5 acres of high quality nesting habitat within 1.3 mi. More information is available on the THP Tracking Center website.